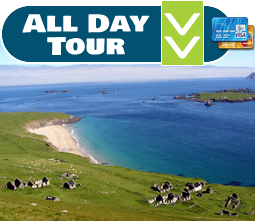 The Blasket Islands are an archipelago of seven islands – Great Blasket Island [ Blascaod Mór ]; Inishvickillaun [ “Dálaighs” or “ Charlies ” island]; Inish na Bró; Tiaracht [Western island ]; Inish Tuaisceart [ Northern island, The Dead Man, The Sleeping Giant ]; Beginish [Small Island ]; Oileán na n-Óg [Island of the Young – sometimes called the Sí, or faeries]; and also there are several hundred rocks – all with names! 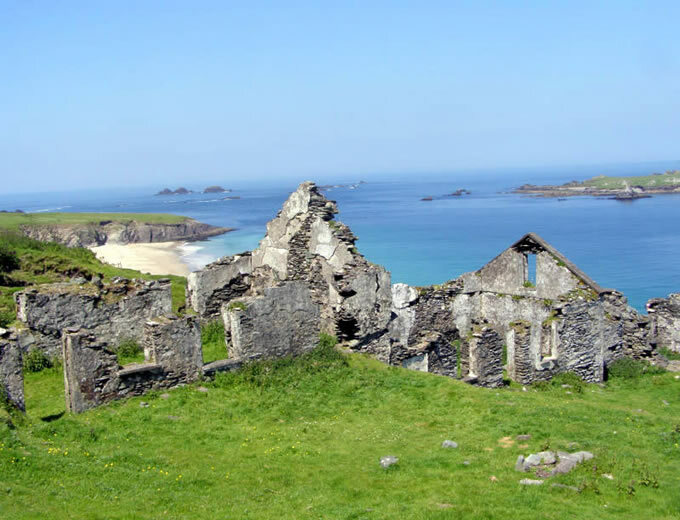 ...is the most famous of the Blaskets [na Blascaodaí], as it is the biggest and also had a population of about 200 and the ruins of the old village can still be seen. 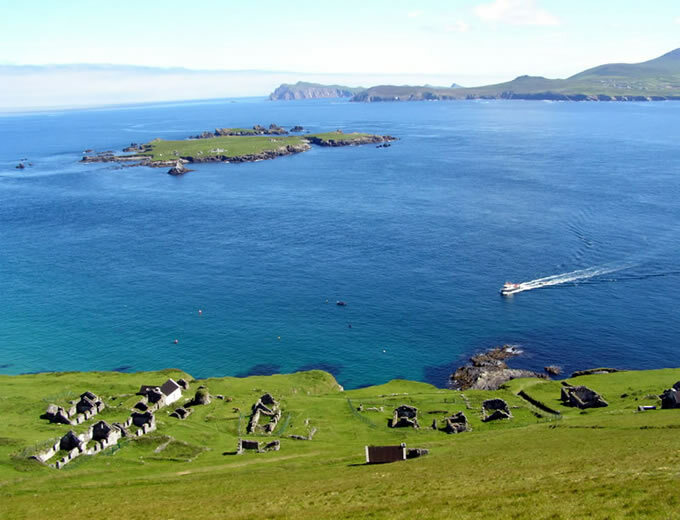 The small community left an indelible mark on the literary history of Ireland with books such as The Islandman [An t-Oileánach] by Tomás Ó Criothain; Twenty Years a Growing [ Fíche Blian ag Fás ] by Muiris Ó Suilleabáin; The Western Island by Robin Flower [ Blaithín ]; Peig, An Autobiography [Peig, Mo Scéal Féin ] by Peig Sayers and many others. 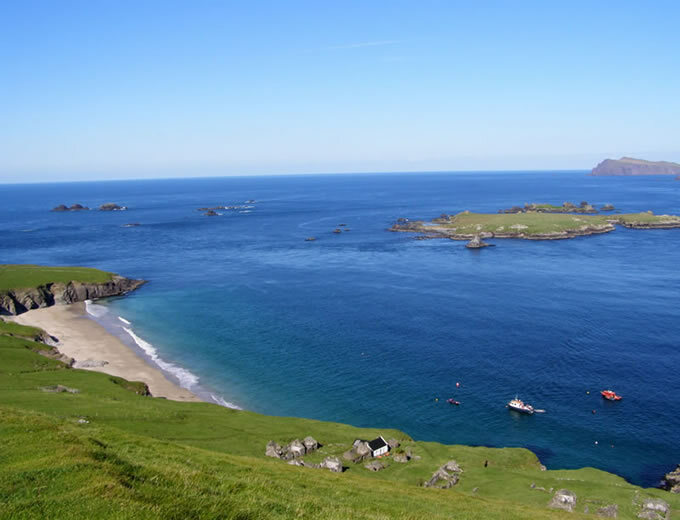 The former inhabitants of the Great Blasket Island were reputed to have the purest and most poetic form of Irish in all of Ireland. 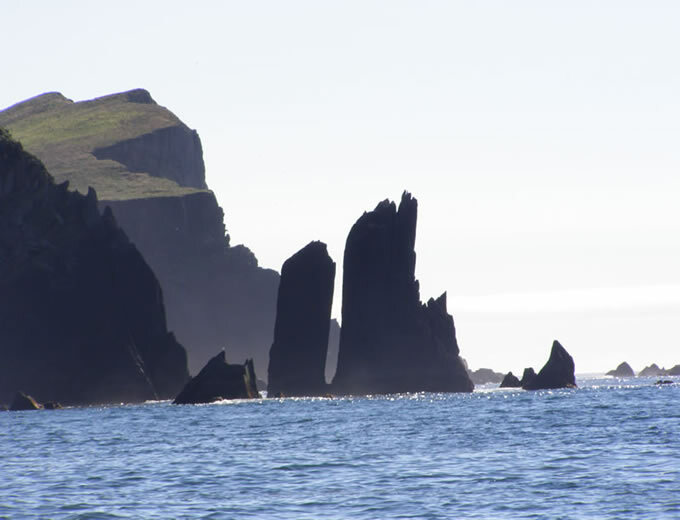 ...is famous because of the spectacular rock formations on its north east point called Cathedral Rocks because they resemble in shape the outline of a giant Gothic Cathedral. 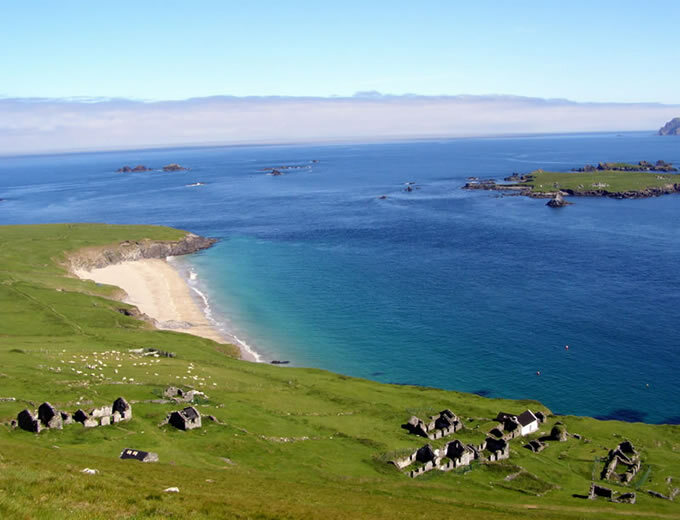 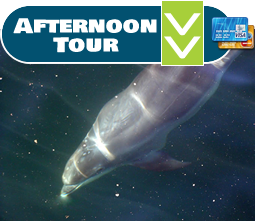 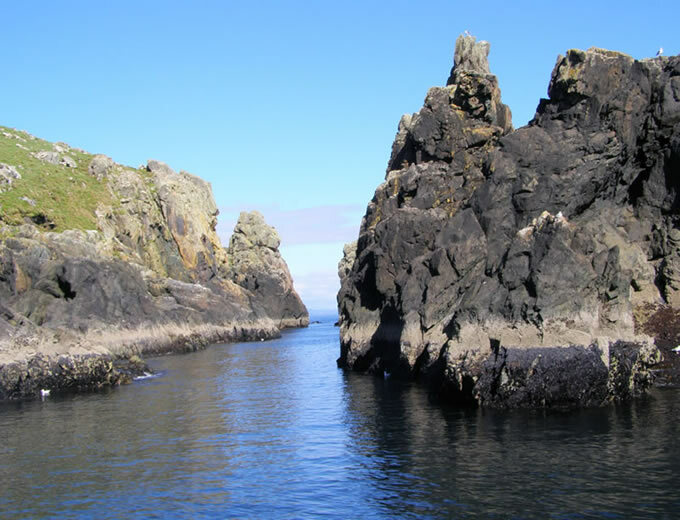 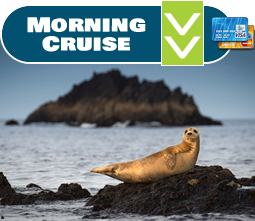 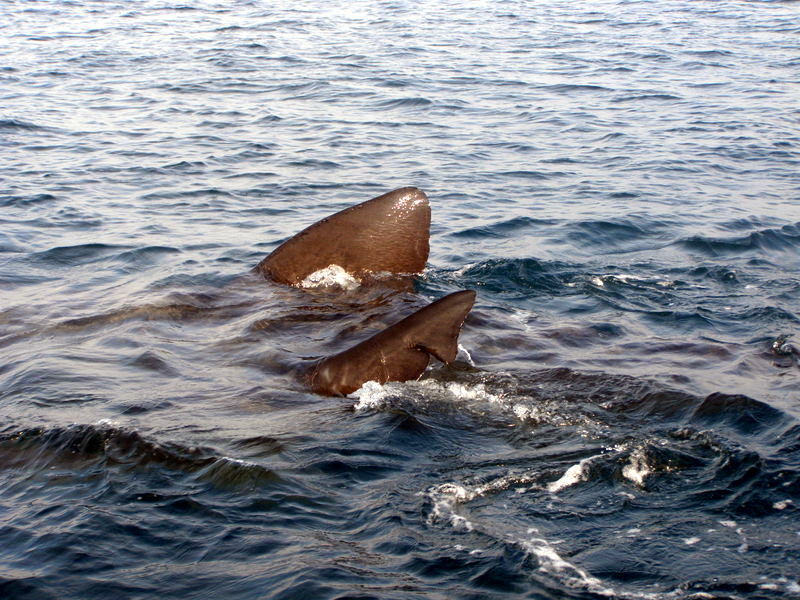 Until Blasket Islands Eco Marine Tours started bringing visitors around the outer Blasket islands they were known only to fishermen and passing sailors, but no doubt in time they will become as famous as the Giants Causeway in Northern Ireland. 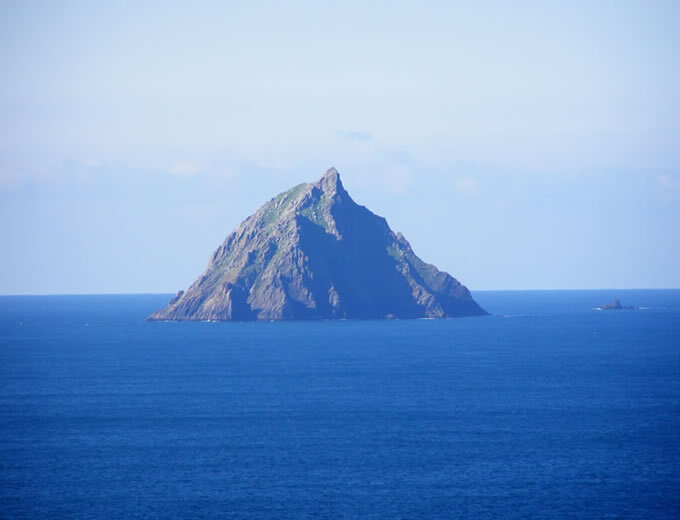 is renowned in traditional music circles as the birth place of the slow air “ Port na b-Pucaí ” [ “ Faery Music”] and also because it was bought in later years by the former Taoiseach [ Prime Minister] of Ireland Charles Haughy. 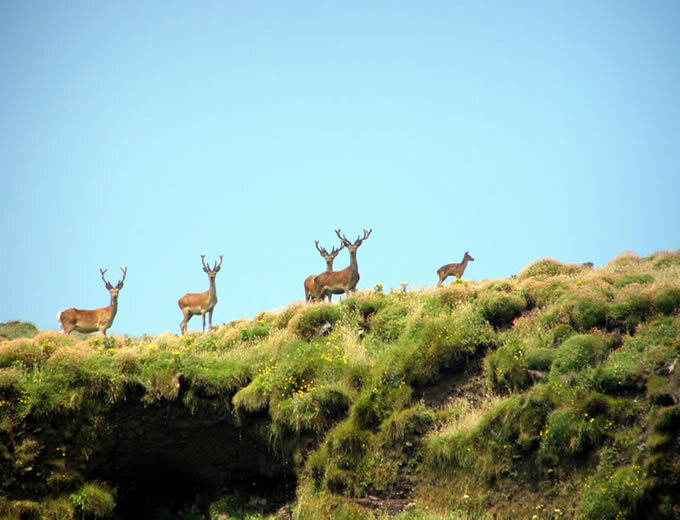 On our tours you can sometimes catch sight of the lovely herd of native Red Deer which he successfully introduced to the island to replace the flock of sheep that once grazed there. 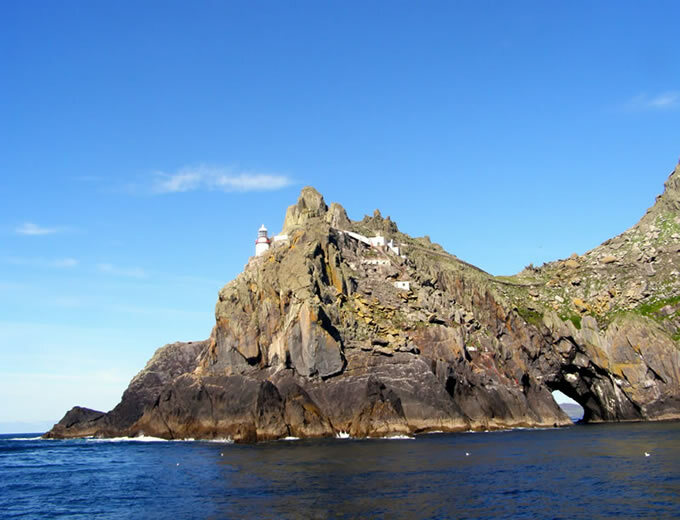 ...has a dramatically situated lighthouse on its western promontory as befits the most westerly lighthouse in Europe [due west is Battle Harbour, Newfoundland, Canada]. 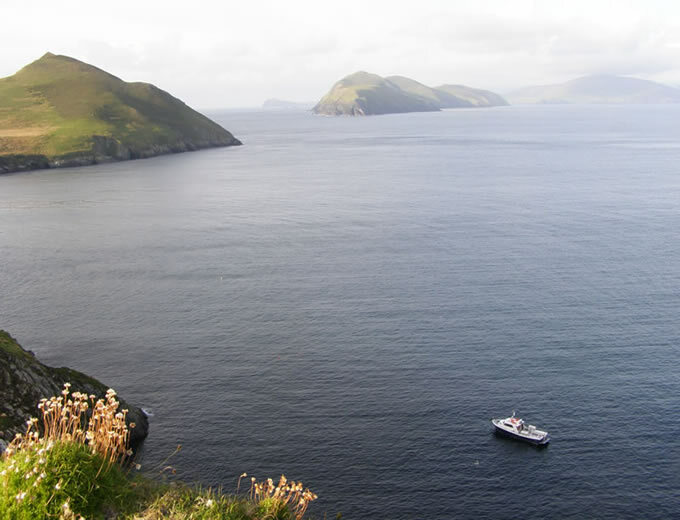 It also has the steepest funicular rail track in Europe from the landing dock to the lighthouse on top. 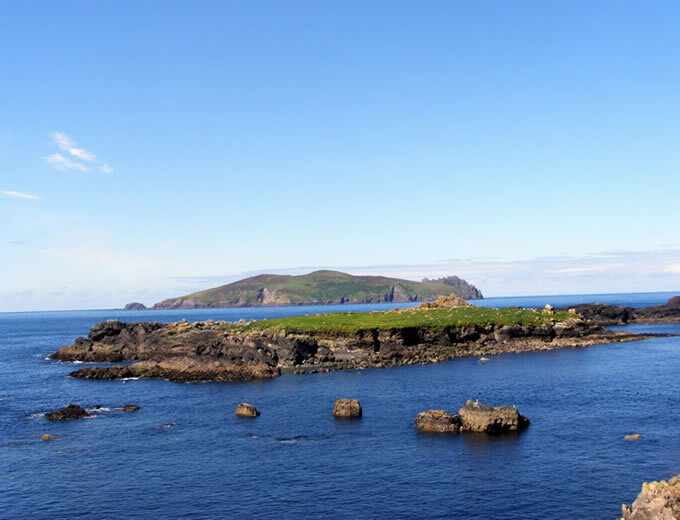 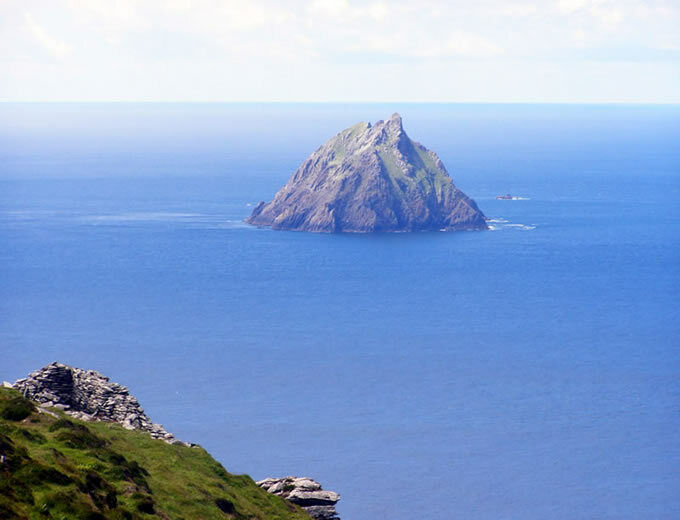 ...are beautiful flat islands just half mile distant from the Silver Strand on the Great Blasket and breeding ground for seagulls and Arctic terns during the summer and hundreds of grey seals during the winter. 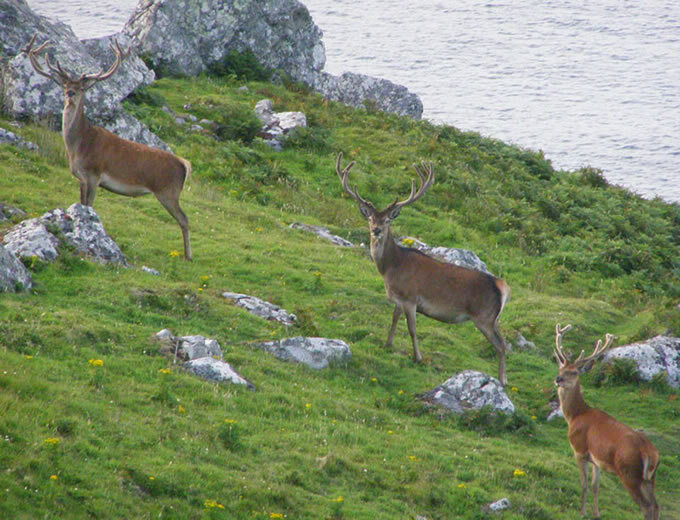 Formerly a flock of about 200 Greenland white-fronted geese over wintered there. 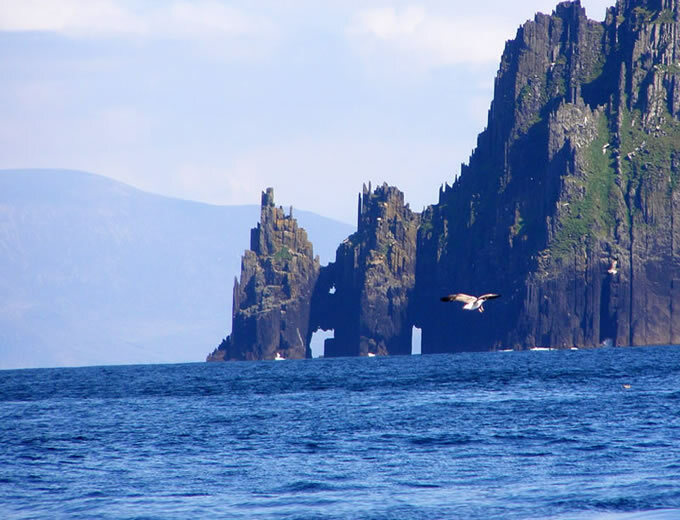 Come on board and we will show you the Blaskets!